Jacqualyn Fouse has committed $762,500 with additional support from the College of Business to establish the $1.525 million Jack and Doris Fouse Scholarship for Study Abroad fund. The gift, named in honor of Dr. Fouse’s parents, will allow international business and Goolsby Leadership Academy students to live out their own international experiences. A UT Arlington Distinguished Alumna, Fouse earned bachelor's, master’s, and doctoral degrees from UTA. 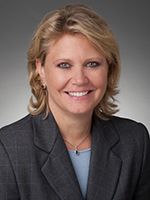 She is president of Global Hematology and Oncology at Celgene, a global biopharmaceutical company. Read more about Fouse's study abroad gift. The Office of Bursar Services has changed its name to the Office of Student Accounts. Effective this week, the new name more accurately reflects the services provided to students. The new email address is studentaccounts@uta.edu. Phone numbers and the location in Davis Hall are the same. For more information, call 817-272-2172 or email studentaccounts@uta.edu. 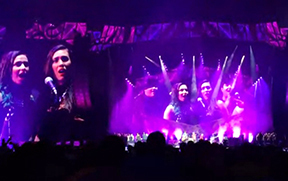 UTA's A Cappella Choir opened the Rolling Stones' encore with “You Can’t Always Get What You Want” on June 6 at AT&T Stadium. Singer Mick Jagger complimented the group after the song. Watch the performance. UTA Libraries has launched a scholarly communication website with various resources and initiatives, such as open access journals, intellectual property, and data management. The site provides an overview of scholarly communication issues related to research, publishing, and teaching, and offers help to faculty seeking information and clarification. Questions? Email Brett Currier, director of scholarly communication. Working with small group leaders, students will have the opportunity to push the boundaries they have set for themselves. Cost is $60, which includes transportation, lodging, and food. 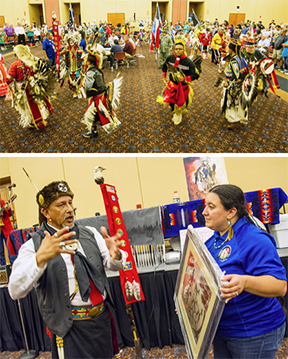 Representatives of numerous Native American tribes participated in the 20th Annual Benefit Powwow on June 7 at the E.H. Hereford University Center. The event raises money for scholarships and is sponsored by UTA's Native American Student Association. Bottom, Joseph Bohanon, left, was honored as founder of NASA at UTA. He teaches Native American studies and psychology at Southeastern Oklahoma State University and is the co-owner of Native Insights Consulting Firm. UTA Libraries has moved microfilm cabinets and readers to the basement of the Central Library. The move frees up significant space on the second floor, which will be used to expand student study areas. The move is part of the library's summer construction phase, which includes expanding the UTA FabLab on the first floor. Summit Avenue between Greek Row Drive and UTA Boulevard is closed for upgrades for at least 45 days. Parking is available at Meadow Run (access from Greek Row Drive) or lot 24 at Summit Avenue and UTA Boulevard at the YWCA Child Care Center. The entrance to the Greek Row parking lot between Davis Drive and Summit Avenue will be temporarily relocated to Davis Drive. The west side of lot S33 will be closed Wednesday-Friday, June 17-19, for the Down Syndrome Partnership of North Texas iCan Bike Camp. The same space will be closed Sunday-Thursday, June 21-25, for the annual UT Arlington Marching Band Camp. Jason Smith is the new director of the UTA Bookstore. He has worked in the bookstore industry for 20 years, including six years at the campus bookstore at Dallas Baptist University. Paul Beaulieu, the former director, was promoted by Follett Higher Education Group. Summer 11-week term Census date. Last day to drop classes for summer I term. Regular registration ends for summer II term. All new students and those not enrolled in the spring term will not be able to register for summer sessions until they file proof of meningitis vaccination. The MyMav schedule of classes is updated daily. Plan to validate your course selections when registration opens. Enrollment verification for the summer semester is available online. To print your verification, log on to MyMav, go to Student Center, and click on Request Enrollment Verification to access the National Student Loan Clearinghouse. Arlington’s comics, anime, and sci-fi convention lands on campus noon-5 p.m. Saturday, June 20, at the E.H. Hereford University Center. Admission is free. The event features local artist appearances, a cosplay runway, a free showing of Guardians of the Galaxy, drawing workshops, anime screenings, Lego scenes, demonstrations of 3D printing for cosplay, and a swag table. 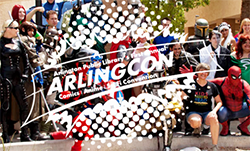 ArlingCon is sponsored by the UT Arlington Libraries and the Arlington Public Library. Blood Drive Roll up your sleeve for Carter Blood Care. Register to donate. Library and University Center malls. Free Outdoor Movie: 'Cinderella' Bring a chair or a blanket, a picnic, and friends for outdoor movies each Thursday. Free popcorn. Upcoming movies are Jurassic Park (1993), June 25; Furious Seven (2015), July 9; The Breakfast Club (1985), July 16. Free. 9 p.m., lawn behind the Maverick Activities Center. EXCEL Campus Activities. Discount Rangers Tickets Texas Rangers vs. Oakland Athletics. Visit texasrangers.com/grouptickets, click on University of Texas at Arlington, and use the password GOMAVS to get your discounted tickets. Various times, Globe Life Park. Fantasy in the Sand Internationally renowned sand sculptors have carved 3 million pounds of sand into several scenes from L. Frank Baum’s famous book, The Wonderful Wizard of Oz. Tickets $19.99 with for ages 11 and younger, active military, and groups. Hours vary. Lot F by Globe Life Park. Through Aug. 23. Fantasy in the Sand. Planetarium The summer schedule features Texas Stargazing; Stars of the Pharaohs; One World, One Sky; Cosmic Color; Dynamic Earth, Pink Floyd, Secret of the Cardboard Rocket, and Spacepark 360: Infinity. Planetarium. Statistical Software: SAS SAS training. Free. 1-3 p.m., Room 04, University Hall. OIT Statistical Services. NCAA competitors: Roland Sales, top, and, bottom from left, Emil Blomberg, Quentin Butler, and Clayton Vaughn competed in the NCAA Track and Field Championships on June 10-13 in Eugene, Ore.
Clayton Vaughn closed out his storied college career last week, earning All-America honors in the 100 meters at the NCAA Outdoor Track and Field Championships. Vaughn, who earned All-America accolades last year at the outdoor championships in the 100m, 200m and 4x100 relay, finished his career as a six-time All-American, including his 60-meter indoor honors in 2012 and 2013. 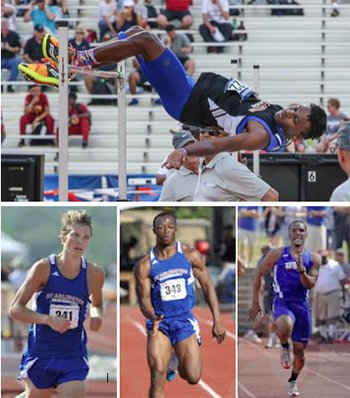 He is the fourth UTA athlete ever to claim at least six All-America honors, joining Elston Cawley (seven), Romain Martin (six) and McClinton Neal (six). Vaughn posted a time of 10.04 to claim eighth place in a blistering final at historic Hayward Field in Eugene, Ore. Junior Roland Sales placed 17th in the high jump after clearing 6 feet, 11 1/2 inches. The Sun Belt Conference finalized the 2015-16 men's and women's basketball schedules, utilizing a 20-game conference schedule. Men's and women's basketball games will be played as doubleheaders for the second consecutive year. Read more about the 2015-16 basketball schedules. The final day of the 2015 Major League Baseball Draft saw a pair of UTA seniors selected. First baseman Levi Scott was picked in the 28th round by the Toronto Blue Jays, while right-handed pitcher Colin Tornberg went in the 32nd round to the Seattle Mariners. The Mavericks have had at least one player selected in 17 of the last 18 drafts, including the last seven in a row. The 2015 MLB Draft marked the 15th time in UTA baseball history that multiple players have been chosen. The women’s basketball team has been selected to participate in the 2015 Preseason Women’s National Invitational Tournament in November. UTA posted a 17-13 record in 2014-15 after finishing with just four wins the previous year. The Mavericks were led by Sun Belt Conference Freshman of the Year Rebekah VanDijk and feature a lineup that returns five starters from last season. The 16-team WNIT field includes 10 schools that advanced to postseason play in 2015, including NCAA Final Four participant Baylor. Matchups will be announced later this month. • Darien McLemore, a junior infielder on the baseball team, has been named to the Sun Belt Conference Leadership Team. The honor goes to a letter-winning student-athlete based on leadership, sportsmanship, community service, citizenship, academic excellence, and other qualities valued by the institution. • Volleyball coach Diane Seymour has announced the hiring of former Auburn standout Sarah Bullock as an assistant coach. Bullock joins the Mavericks’ staff after two years as a coach with the Dallas Skyline Juniors. The deadline for sand volleyball is June 24. Individual sports are free and include racquetball, June 24; billiards, June 25; badminton, July 14; poker, July 23; and MavStrong competition, Aug. 6.